I wasn’t going to watch it and then, I did, and after a few false starts, I was gripped. So kudos to all involved with the new TV Movie series “The People Vs.O.J. Simpson”. Based on the book by Jeffrey Toobin, it’s very well done. And smart, too. I was gripped. Even though, we all know how it turned out. No spoilers are necessary, as this was the first court case that was turned into a TV series already when Judge Ito allowed cameras into the courtroom. It crackles. It’s sharp and it’s right on the money Writtten by .Scott Alexander and Larry Karaszewki and directed/co-produced by Ryan Murphy “The People…” sizzles and burns up the small screen in just the right way. I was surprised. And delighted. Smart TV is always welcome. And the casting is phenomenal. Cuba Gooding, Jr. FINALLY lives up to his Oscar potential (He won Supporting Actor EONS ago, it seems, for “Jerry Maguire” opposite Tom Cruise and a very young Renee Zellweger. 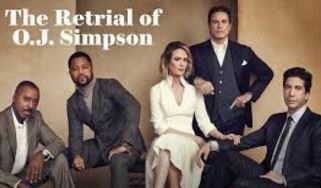 )Yes, Cuba Gooding IS O.J. in this, although he is a man of much smaller stature. He has the bravado and the charm and the impatience of a super-star-football-hero-jock, which is what he was. 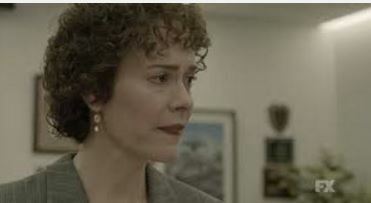 And Sarah Paulson, always a personal favorite, gets the role of HER career as the prosecuting attorney Marcia Clark. She is depicted here as a harrowed, over-worked single mom, and a feminist, who is appalled by the case she’s just been handed. It seems to her like it should be open and shut, except it isn’t at all. Strangely, “The People…” doesn’t take sides and depicts the LAPD as the bumbling bunch of key stone cops that they probably were, in this instance. Sarah Paulson really delivers here and puts her in the realm of leading lady roles where she’s always belonged. And David Schwimmer, of all people, is just grand as the compassionate heart of the O.J. side of things as Robert Kardashian. Yes, the father of all those Kardashians who now reign supreme as the Queens of Reality TV. And yes, Kris Kardashian Jenner is depicted, too. Although she only has a very small part to play in Episode One. She was a very close friend of the murdered Nicole Brown Simpson. He was a lawyer and one of O.J.s best friends who is just bewildered by the unbelievable events he sees unfolding around him. O.J. hides out at Kardassian’s house and we see him even attempting suicide in “Kimmy’s” bedroom, as the stricken Schwimmer, pulls him out of it.Before he disappears from the Kardashians hideaway starting his infamous White Brono chase. 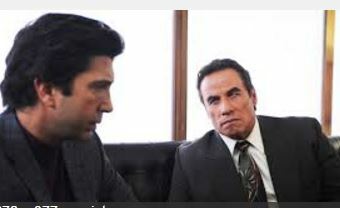 In sharp contrast, there is ANOTHER lawyer, Robert Shapiro, who is played again at the top of his A-Game by John Travolta! Another shock. And a shockingly good performance. One of the best of Travolta’s career, and he is the super slick lawyer, a legal shark, if ever there was one, who knows that his client is guilty, probably, and goes for it, takes the case, anyway. People forget now, but it was on TV EVERY SINGLE DAY FOR MONTHS! I watched the entire proceedings unfold with the rest of America. I was living alone in the Bronx after my mother’s death. I wondered what she would’ve thought of all of it. I was as gripped then. As I am gripped now by this exciting, insightful news series that is going to be on at 10pm on the FX channel on Tuesday nights for nine more weeks. And even though I thought I knew everything about it, “The People Vs. O.J. Simpson” is constantly revealing new and startling aspects and yes, it WAS the birth of reality TV. Kardashians and all.